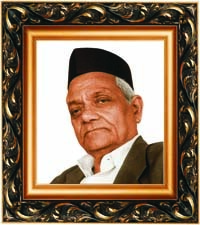 Founder Parampoojya Sardeshmukh Maharaj | Cancer Research Project - Ayurved Hospital and Research Center - Bharatiya Sanskriti Darshan Trust . :Ayurveda for Cancer:. Parampoojya Prabhakar Sardeshmukh Maharaj believed in social reform that can be achieved by younger generation and wanted to link that glorious past of ancient India to the future generations. Maharaj founded Bharatiya Sanskriti Darshan Trust for this noble cause and spent all his time for the rejuvenation of the ancient and rich Indian Culture, which can enlighten everybody’s life in these days of stress, unrest and blind imitation. He has been a self-made & enlightened personality. Parampoojya Maharaj was a multifaceted personality who had an imposing knowledge about the Vedas, music & Ayurvedic medicine. He was a versatile personality who showed skills in veterinary science also. This intangible personality was born on the 25th November 1920 at Solapur, in the Jamindar family who were bestowed with the membership of the Akkalkot Sansthan. Born to a family known for their knowledge of the Vedas & Medicine he carried forward this trend. Since childhood his prowess was well known. This multifaceted jewel stone glistened even brighter with the blessings of his Holiness Shri Mali Maharaj since the year 1943, when his depth of knowledge cognised far & wide. Luminaries in the field of literature & music would seek his advice. They were impressed by his personality, knowledge & abilities. With the power of meditation he helped to discover the tombs of Chhatrapati Sambhaji Maharaj & Maloji Rao of Indapur & Queen Yesubai of Satara. With the depth of his Ayurvedic knowledge, his spiritual self healed many patients. Inspite of his imposing knowledge, he choose to remain aloof from limelight. This was an ethical bonding he put over himself. He used his spiritual knowledge for good cause. Maharaj has got number of disciples in India and abroad. On the 26th August 1996, the holy soul took Samadhi & detached himself from the earthly World. In the physical absence of Parampoojya Maharaj (one can feel the bliss of Parampoojya Maharaj’s in the atmosphere at Wagholi) a Math (Monastery) is built for his followers to attain real peace of mind. The holy, sacred atmosphere, created by the harmonious photos of Shri Mali Maharaj being the spiritual Guru of Shri P. K. Sardeshmukh Maharaj and Shri P. K. Sardeshmukh Maharaj himself, gives feeling of being close to Maharaj, under his shelter, enabling one to rediscover himself in a very different way. It makes our head bow down with the same humbleness, which people used to experience with Maharaj. Wagholi is such a place where nature is present in all its splendor. The surrounding area of Math is decorated by number of flowers plants of variety of colours by disciples of Parampoojya Maharaj as he was very fond of flowers. The cooling breeze in Math area rejuvenates ones senses. As Maharaj was very keen about health protection this math is also used as Yoga Centre. The invigorating ambience in Math makes Yogasana, a pleasant experience. On holy days throughout the year viz. Maharaj Samadhi Din, Maharaj Jayanti, Mali Maharaj Jayanti Bhandara is held which is usually attended by followers and disciples of Maharaj. The vibes in Math and surroundings makes one feels blessed by this spiritual personality.